There are many things that could easily go wrong in a commercial kitchen. In its confined space come together a host of potentially hazardous materials. From fires to boiling hot oil to dozens upon dozens of sharp objects, not to mention employees who are fighting against stress and trying to beat the clock on a regular basis, there are a lot of factors to consider. These facts alone make commercial kitchen safety crucial. Of all the hazards that abound in the commercial kitchen, floors remain at the top of the list of the most common causes of accidents. Everything from poorly designed floor plans to obstructions and slippery floors can turn regular kitchen floors into hotbeds for accidents. The old adage “prevention is better than cure” cannot get any truer, or more important, than on the topic of kitchen floor safety. Standard safety signs for wet and/or greasy floors should be in place as soon as spillage occurs. It’s also a good idea to supplement the warning signs with barricades to make sure that no one steps on the affected areas before they get cleaned up. Employees should be well-versed in commercial kitchen safety, including technical know-how of proper cleanup techniques for different types of spills. It’s also important to implement a storage and cleanup system to ensure that everyone knows where every item belongs so there are no obstructions (like loose wires, for example) that could cause tripping or disrupt the flow of the kitchen’s floor plan. The right type of footwear for use in a commercial kitchen is one that not only provides additional ergonomic comfort for the wearer but actually features additional traction as an added layer of protection against slips. 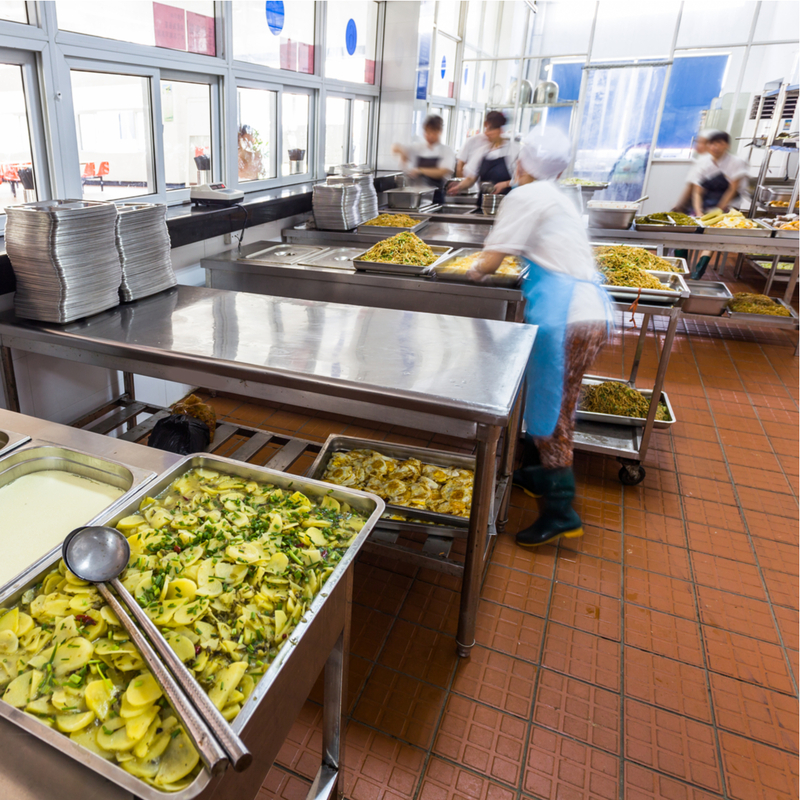 With spills and debris being the biggest causes of slip, trip, and fall accidents, floor cleanliness is a most crucial element in maintaining commercial kitchen safety. Always have a set of dust and wet mops handy to promptly attend to spills as soon as they occur. Apart from keeping your floors clean and free from debris and obstructions, your best protection against kitchen floor-related accidents is the right kind of floor mats. There is a wide range of floor mats designed to boost commercial kitchen safety – from mats that prevent grease buildup to mats that are intended to make commercial kitchen work feel a whole lot less strenuous on the lower extremities, thereby helping prevent injuries and long-term health complications associated with working for extended periods while standing. When it comes to commercial kitchen safety and maintenance, you need more than just a good pair or two of mats and mops. What you truly need is a service partner that will help you keep up with the wear and tear of your mats and mops, and will bring you topnotch-quality mats and mops to help you with the upkeep and safety of your restaurant’s kitchens. What you truly need is Dust-Tex by your side! We are your top source of high-quality mats and mops designed to help you get the cleanest and safest floors for your commercial kitchens. You are a single phone call away from improving your commercial kitchen safety. What are you waiting for? Call us today at 808-842-4811 and get started!